Okay, I've decided against the dellorto for now, didn't really like the non-japanese looks on my mostly japanese bike. 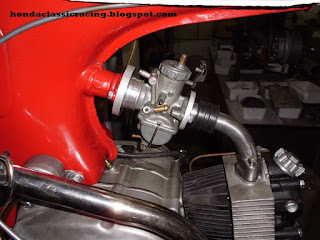 So I've found myself another 20mm powerjet carburettor to adapt to my c110 racebike. Started making some flanges, using an intake rubber I had laying around. Bit more modern then the S65 rubber on the other setup, but that is moving over to my C110 streetbike to be a period correct upgrade over the original 16mm carburettor. Just because I use it daily if possible and in modern traffic, every bit of power is welcome. The 16mm with all bits belonging to it will be stored so the bike could be brought back to original when wanted. Any significant power increase with the 20mm? I have a bone-stock C110 I'm looking to modify somehow, it's quite the dog on hills with the 3-speed gearbox!